Ankara (AFP) - President Recep Tayyip Erdogan's main rival in Sunday's polls on Friday challenged the Turkish strongman in a mass rally in the capital Ankara, inviting him for a television debate as a "last chance." "Tomorrow is the last evening. If you have the courage, confront me," Muharrem Ince, a fiery lawmaker from the secular Republican People's Party (CHP), told hundreds of thousands of people in Ankara. "Look, that's my last proposal to you ... If you want, I can even cancel my Istanbul rally for you. Come, confront me, let's debate on tv," he said. 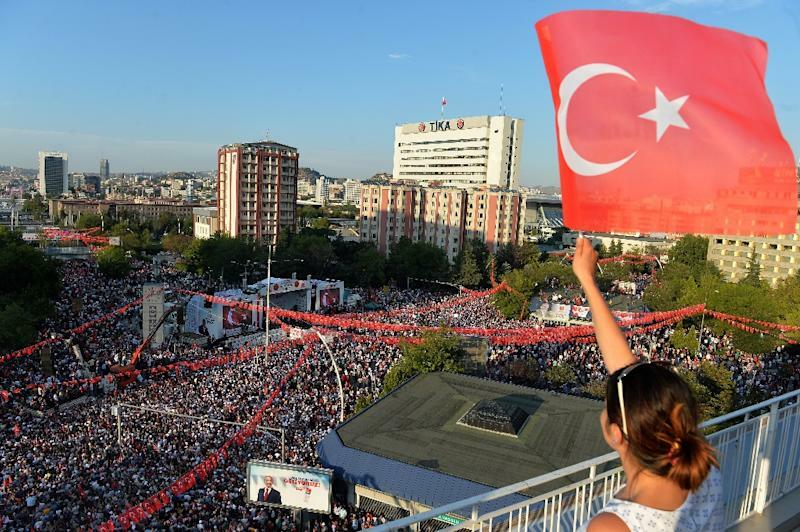 The Ankara campaign comes only a day after Ince gathered hundreds of thousands in one of the biggest election rallies in years in the Aegean city of Izmir. And he is due to hold another rally in Istanbul on Saturday. Erdogan, a favourite to win the presidential polls, has in the past rejected the opposition candidate's proposal for a television debate, saying that "I don't want anyone to get points through me". Ince has injected a breath of fresh air into the presidential campaign with his dynamism and oratorical skills comparable to those of Erdogan. Many analysts say he could force the president into a second run-off on July 8. In Ankara, Ince accused the state-run Anadolu news agency and TRT television of committing a "constitutional crime" for failing to be even-handed. "TRT aired Erdogan for 181 hours, Muharrem Ince for 15 hours," he said.